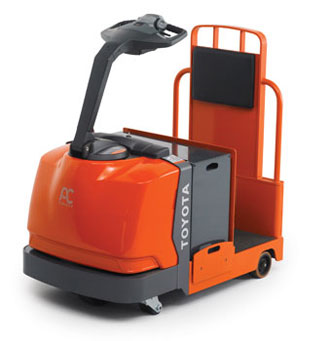 Featuring AC drive system technology, Toyota offers a wide range of 24-volt, electric pallet jacks to meet your productivity needs. Industry-leading levels of performance and reliability can be found in all of our walkie pallet, end-control walkie/rider, center control rider and tow tractor units. Attention to operator efficiencies and ease of service put overall equipment value to work for you. Multi-function control handle has ergonomically positioned dual thumb wheels with twist grips and horn buttons for simplified operation of all controls with either hand. High-speed interlock allows the operator to maintain top travel speed without continuously pressing a button for long distance transport, increasing freedom of movement. Low-platform step height eases frequent entry and exit during floor level order-picking for reduced body fatigue. Polyurethane torsion block casters act as shock absorbers to improve operator ride comfort. Rubber drive tire and polyurethane load wheels provide a smoother ride and longer tire life. AC drive system offers fast response to operating commands, precise power control, compact components and provides high productivity throughout the entire shift. Polyurethane torsion block casters improve cornering under all conditions, optimizing stability and load handling. Hitch designed to handle carts and trailers of various sizes and construction for ultimate versatility. AC drive motors have no springs, brushes, commutator or wearable parts to help reduce planned maintenance. One-piece, lightweight service access cover conveniently snaps on and off for easy access to major components reducing service time during inspection. Steel reinforced control handle is impact-resistant and easy to service by simply removing four screws. On-board self-diagnostics with built-in analyzer simplifies troubleshooting and eliminates the need for an external hand-held analyzer. AC drive system eliminates the need for the directional contactors to help reduce routine maintenance and inspection time. Durable aluminum cover helps protect the control handle and vital electronic components.